While neither Karate Kid Part III nor The Next Karate Kid are great entries in the series, far from it, there are some cheesy fun moments in both and also nice seeing Hilary Swank early in her career. Mill Creek Entertainment provided me with a free copy of the Blu-ray I reviewed in this Blog Post. John Kreese (MARTIN KOVE) is back and more dangerous than ever. Blaming Daniel (RALPH MACCHIO) and Mr. Miyagi (PAT MORITA) for the loss of his karate school, the revenge-obsessed sensei asks evil martial arts master Terry Silver (THOMAS IAN GRIFFITH) and Cobra Kai student Mike Barnes (SEAN KANAN) for no mercy! Julie (HILARY SWANK) is a rebellious teen who needs a little help from her friends – in this casr the wise Mr. Miyagi (MORITA) and a trio of Buddhist monks. The action kicks into overdrive when Julie is pitted against a posse of paramilitary students who rule her high school. And while their leader (MICHAEL IRONSIDE) teaches them to fight to kill, Julie and Miyagi teach them the secret of fighting to live. No features were included and only a movie selection menu. With two movies put on a single layer, 25 GB disc, expectations weren’t exactly high and at least with The Karate Kid 3, does not at all look good. With that film, there were many instances of some artifacting in some scenes while others appeared to have been DNR’d to death. In regards to The Next Karate Kid, it does look a bit better but perhaps because it is slightly newer, even so detail was soft and colors look on the drabber side. 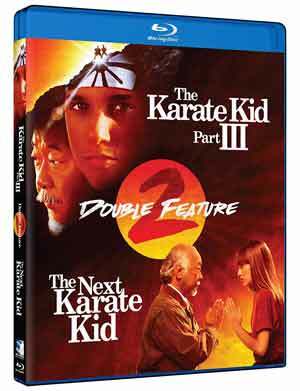 The Karate Kid Part III comes with a Dolby Digital 5.1 track and The Next Karate Kid a Dolby Digital 2.0 track. Neither one of these are anything special and it is a shame the studio didn’t include lossless tracks, still are perfectly serviceable outputting clear enough dialogue levels though in both instances, has lackluster depth. While neither Karate Kid Part III nor The Next Karate Kid are great entries in the series, far from it, there are some cheesy fun moments in both and also nice seeing Hilary Swank early in her career. As for this Blu-ray double feature, this is your basic release from Mill Creek with no bonus material and the transfers are nothing to write home about.